Have you ever listened to a debate where one person begins to argue against a point the other person never made? This may sound like a strange situation, but it is actually typical within the bounds of what may be considered the dark side of debate. When we refer to a 'logical fallacy,' we are referring to logical flaws used by either those who are intellectually unaware or those who are deliberately deceptive toward the unaware. These fallacies are typically used to deceive the unawakened audience. On a larger scale they are regularly used by the Cabal and their media apparatus to psychologically manipulate the thoughts and opinions of the world's population to maintain global control. 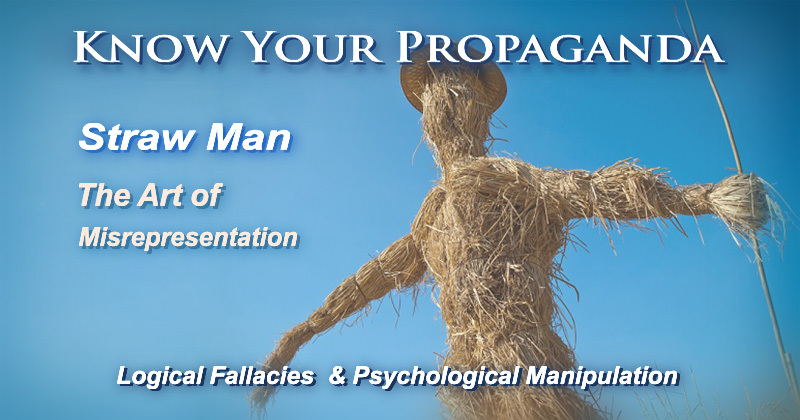 The specific fallacy we are discussing here is known as the Straw Man tactic. This fallacy can be a particularly deceptive tactic in that it is not as blatant as other fallacies, but before getting into detail, let's get some definition on the subject. Therefore, claim Y is false. Ted: Biological evolution is both a theory and a fact. Edwin: That is ridiculous! How can you possibly be absolutely certain that we evolved from pond scum! Ted: Actually that is a gross misrepresentation of my assertion. I never claimed we evolved from pond scum. Unlike math and logic, science is based on empirical evidence and, therefore, a scientific fact is something that is confirmed to such a degree that it would be perverse to withhold provisional consent. The empirical evidence for the fact that biological evolution does occur falls into this category. Explanation: Edwin has ignorantly mischaracterized the argument by a) assuming we evolved from pond scum (whatever that is exactly), and b) assuming “fact” means “certainty”. Zebedee: What is your view on the Christian God? Mike: I don’t believe in any gods, including the Christian one. Zebedee: So you think that we are here by accident, and all this design in nature is pure chance, and the universe just created itself? Mike: You got all that from me stating that I just don’t believe in any gods? Explanation: Mike made one claim: that he does not believe in any gods. From that, we can deduce a few things, like he is not a theist, he is not a practicing Christian, Catholic, Jew, or a member of any other religion that requires the belief in a god, but we cannot deduce that he believes we are all here by accident, nature is chance, and the universe created itself. Mike might have no beliefs about these things whatsoever. Perhaps he distinguishes between “accident” and natural selection, perhaps he thinks the concept of design is something we model after the universe, perhaps he has some detailed explanation based on known physics as to how the universe might have first appeared, or perhaps he believes in some other supernatural explanation. Regardless, this was a gross mischaracterization of Mike’s argument. Exception: At times, an opponent might not want to expand on the implications of his or her position, so making assumptions might be the only way to get the opponent to point out that your interpretation is not accurate, then they will be forced to clarify. As stated, this is a particularly deceptive tactic. In fact, the audience may not even know the fallacy has been committed until long after it has had its effect. In order to catch the Straw Man fallacy and acknowledge it, we must be able to listen intently the debate or discussion taking place. When a participant strays from the actual topic or gives an example of the topic that does not accurately fit the topic, this tactic may be in use. In recent time, we have actually seen the tactic of Straw Man used quite frequently, though we may not have noticed. Within the truth community, there has been a trend among those who seem to be less awakened than others. Certain individuals, when presented with a growing trend of alternative thought or opinion they do not agree with, will arbitrarily accuse those who state the opinion of being in a cult. The accuser will then proceed to preach about how unhealthy narrow-mindedness, group think, and unconscious acquiescence is (which by itself, is true) when in reality, none of these apply to the situation at all. The individual who held the popular idea may have come to their conclusion on their own, but those accusing them of cult-mentality often ignore this possibility completely. Such accusers seem to accept no other possibility and may even obsess over their own limited perspective (thus assuming the form of their own accusation). In reality, it is completely possible for two or more people to independently observe an object, a situation, or a condition therein and afterward, independently come to the same conclusion. However, it seems that some disagree with this possibility. Regardless, the possibility exists and it is only responsible for us to consider all possibilities when attempting to find the truth to any situation. This is one of many examples of the use of the Straw Man tactic. Related post: Know Your Propaganda - "False Dilemma" - What is It? Often, the examples used in Straw Man will be oversimplified, exaggerated, or will in some way, misrepresent the position of the opponent to such a degree that it distracts from the topic of debate. When we see this distraction from, and misrepresentation of the original topic, we know the likelihood of the Straw Man tactic being used. This is a tactic that typically only works on people who are largely unaware of the world around them. This fallacy may fool those who are inattentive to detail or those who assume that everything they are presented by the establishment is true. In such a state of mental apathy, it can be easy to miss the important details of discussion that would reveal logical fallacies. This is how we know the likelihood that these fallacies come from a place of cognitive inattention and/or irresponsibility. It is, of course, an honorable goal to strive to increase our level of conscious awareness as well as our skills of listening, observation, critical thinking, and deductive reasoning. This way, we can be better suited to be logically responsible and to maintain the quality of our own debating skills. And as we do, we can be better able to help those around us maintain and grow their own ability to observe and appreciate the world around them. With that here is a word from Dr. Gregory B. Sadler—instructor, president, and co-founder of ReasonIO.